I’ve always been a fan of journaling. I find it great for venting and gaining perspective on things, as well as enjoying jotting down random thoughts and ideas. 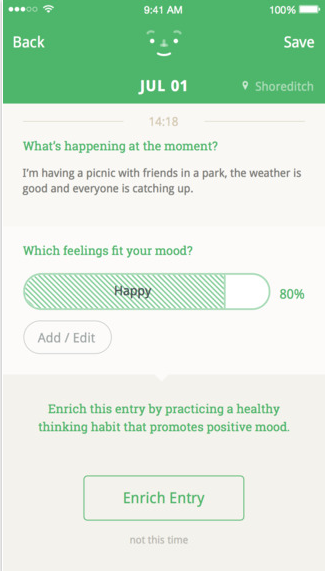 So when I heard about Moodnotes, a new app for iOS that aims to track your moods and feelings through journaling, I felt compelled to give it a go. It costs $3.99 to download and works by sending you a daily notification asking you to rate your overall mood using an adjustable smiley face. Depending on your response, you are presented with a couple of relevant questions to help you dig a little deeper about why you feel the way you do, whether it’s happy, sad or indifferent. Moodnotes isn’t just for when you’re feeling down, it helps you get to know yourself and your mood patterns better so over time, you start to recognize the different patterns and learn what kind of thoughts can trigger specific feelings. The point of the app is to keep using it and over time, it gets you to reflect and learn your thought patterns and feelings in different situations. It also gives advice on ‘thinking traps’ and how you can deal with them in a rather blunt manner. I’ve been using Moodnotes for a while now and having just moved to a new country, stress levels and emotions have been high at times. I was skeptical at first that it could do anything for me as I don’t see a therapist and would count myself as a fairly jolly person. However, last week marked the anniversary of a good friend’s passing, which is never easy. And on reflection, I found that I was more honest with Moodnotes about how I felt than anyone else. I aptly described my raw mood, answered the subsequent questions truthfully and took the app’s decent advice on board. I’m not saying that I didn’t feel a little low and emotional on that day or advocating that anyone stops speaking to a doctor or confidant, but for me personally, it helped. I still spoke to my friends and family, remembered my late friend and got emotional, but I felt more capable of carrying on as normal with the extra level of support. 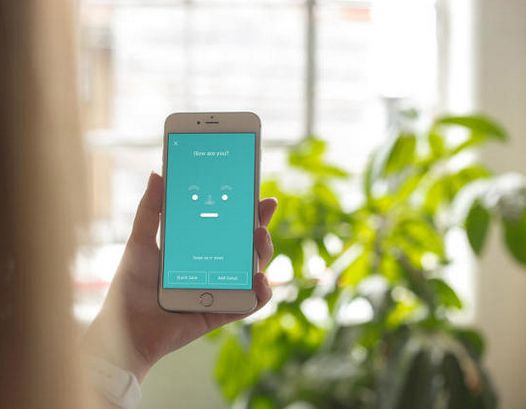 Created by Thriveport LLC with a team of healthcare professionals and designed by the same people as Monument Valley, the app is legitimate in the advice it offers and intuitive. Each stage is designed to reflect the methods of cognitive behavioural therapy (CBT) so don’t let the colorful interface fool you. While traditional therapy probably won’t be replaced by the app just yet as the power of human interaction can’t be emulated, it’s definitely a viable supplementary tool and potentially a replacement for some. Health and fitness apps to help physical health and dieting have become some of the most popular downloads in recent times, so think of Moodnotes as a trainer for your mental health.